The struggle for supremacy between Britain and France dominated the History of the British Army from 1688 to 1815. the struggle began with a ferocious infantry-battle in wooded ravines on the edge of the Ardennes in 1692. King William had his men on the move long before dawn on 3 August 1692. Pioneers went ahead to hack a way through the woods, and the army moved up behind them organised into three divisions. 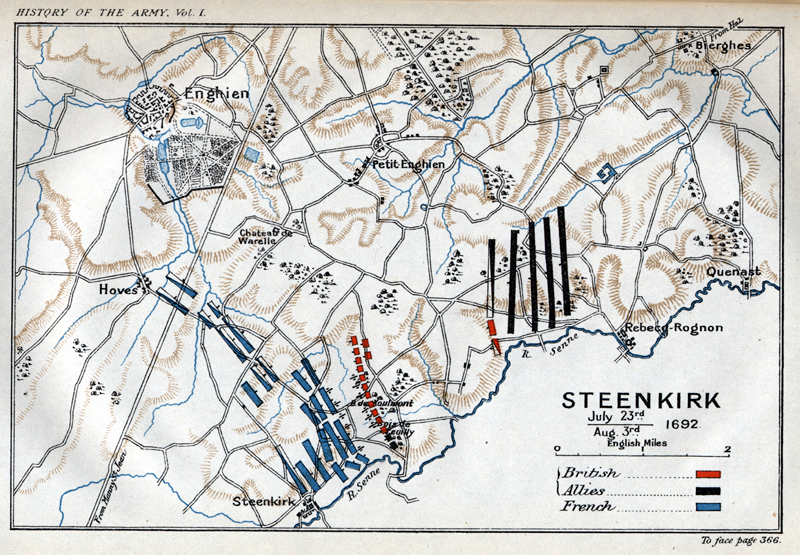 Below is the plan of the Battle of Steenkirk illustrating the British forces in red, Allies in black, and the French in blue. Taken from our new series A History of the British Army in 25 Battles. To read the full article, see Issue 11 of Military Times.